The standard way of thinking about space missions is that once you've done something successfully, you try to do it again, only bigger and better. The aging Hubble Space Telescope, for example, will be followed by the larger, more powerful James Webb Space Telescope. The Mars Exploration Rovers Spirit and Opportunity, each about the size of a golf cart, are soon to be one-upped by the far more capable Curiosity rover, which is as big as an SUV. But a new space telescope that's recently completed a first round of testing in the New Mexico desert turns that logic on its head. The massive, orbiting Kepler probe, the most prolific plant-hunting machine in history, with more than 2,300 worlds under its belt so far, is going to be followed not by a bigger Kepler, but by a satellite small enough to fit in a backpack, with plenty of room left for lunch and a sweater. And where Kepler keeps its gaze fixed on more than 150,000 stars at once, the new orbiter, known as ExoplanetSat, will look at one star at a time, hoping to see a tiny wink when an otherwise invisible planet blocks the star's light as it moves through its orbit. What makes ExoplanetSat even more un-NASA-like is that it began as a class project  although admittedly, the class was at MIT. It was a design-and-build course, which the university's engineering students have to take in order to graduate. In a recent semester, the class was co-taught by Sara Seager, an astrophysicist who has done groundbreaking research studying how the atmospheres of planets orbiting distant stars might look like from earthly telescopes. Seager recruited five science undergrads to join her engineers, on the theory that out in the real world, they'd eventually have to work with engineers anyway. The students were told to figure out a way to find planets using CubeSat, a design concept that came out of California Polytechnic State University, in San Luis Obispo, about a decade ago, specifically for student engineers looking to get their own little satellites in space. The basic CubeSat is a literal cube, 10.6 cm on a side, which is, unsurprisingly, very cheap to launch since it can easily piggyback on other payloads. CubeSats are also designed to be bolted together to form bigger satellites; the MIT students ended up using three to form a box that's 10.6 cm wide, 10.6 cm high and 0.3 m deep. That didn't leave a lot of room for everything they had to get inside: lenses, detectors, power supply and more. The students' biggest complaint, however, says Seager, "was that we should have told them how to talk to the engineers before the class started. They spoke an entirely different language." The two groups did eventually work out a design, and it turned out to be good enough that NASA agreed to launch what they built. Originally, blastoff was supposed to happen this fall, says Seager, but "we're like any space project. Things cost more than we expected. We still do have a launch slot, and as far as we know, NASA will hold it for us." One of the expensive sticking points in the design concerns the tiny telescope. In most cases, space telescopes have a second, smaller scope attached that actually finds the objects the big one will look at. There's no room for that, so the ExoplanetSat group  now grown to include grad students and collaborators at Draper Laboratory, based in Cambridge, Mass.  had to design a star tracker and telescope in one. The good thing about that, says Seager, is that the device can be used for all sorts of other projects. Planetary Resources, she says, the company that wants to mine asteroids, is looking for a space telescope to identify good prospects, and the new camera might be ideal for that purpose. 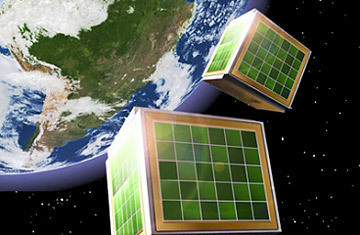 The CubeSat's first job, however, and that of the seven more such minisatellites Seager's group wants to send up if the prototype is successful, will be hunting for planets, specifically earthlike planets orbiting relatively close sunlike stars. Those would be the true exoplanet mother lode since very distant planets, like the ones Kepler looks for, are too far away to probe for signs of life. While the CubeSat can find the relative arm's-reach planets, it can't conduct those biological surveys. But when the James Webb Space Telescope goes up in 2018 or so, it could have a nice target list all ready and waiting.